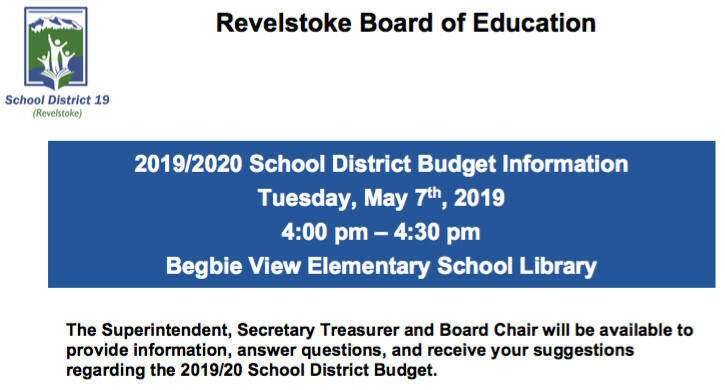 The art department at Revelstoke Secondary School (RSS) is teeming with talent. 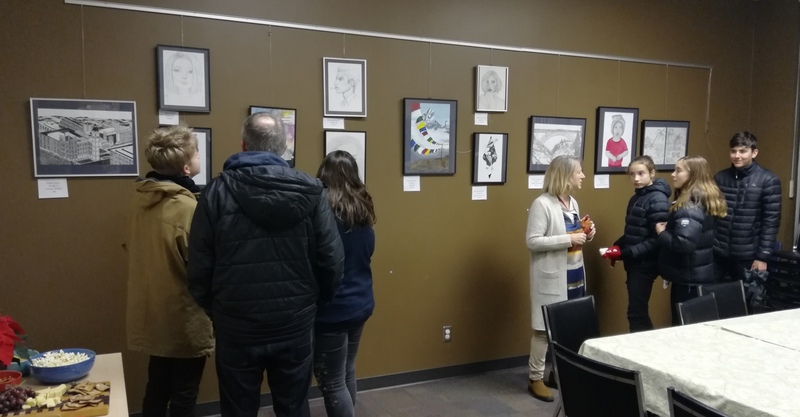 Last night, December 11 2018, marked the opening night of the students’ art show at the Revelstoke Library. 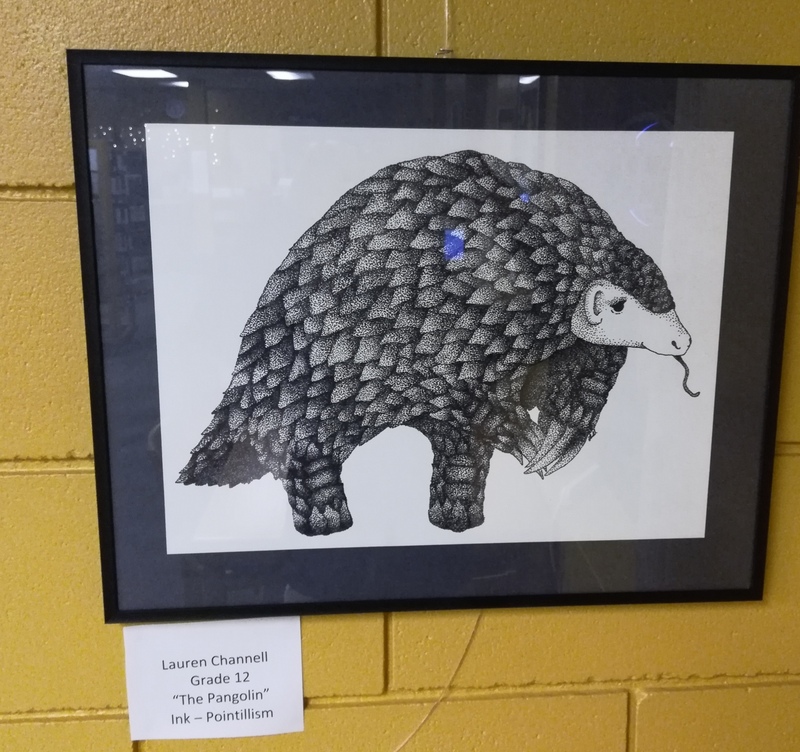 Parents, artists, fellow students and other patrons took in the many different pieces of artwork in a variety of mediums. 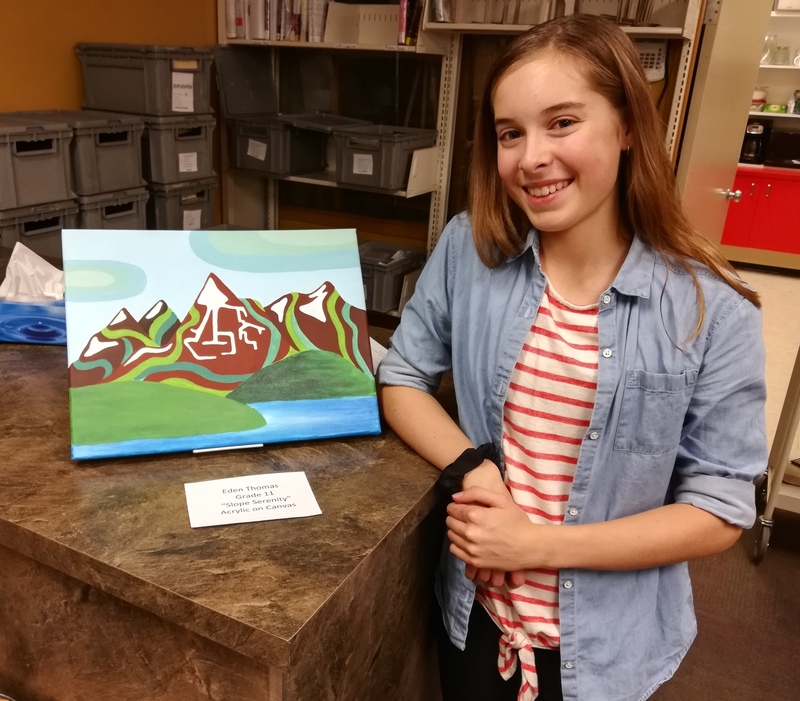 Organized by Lucie Bergeron of the Revelstoke Library and SSC art teacher Theresa Browning, the exhibit features artists from grades ten to twelve. Bergeron and Browning are both artists, so it is no surprise they are passionate about bringing art to the public eye. 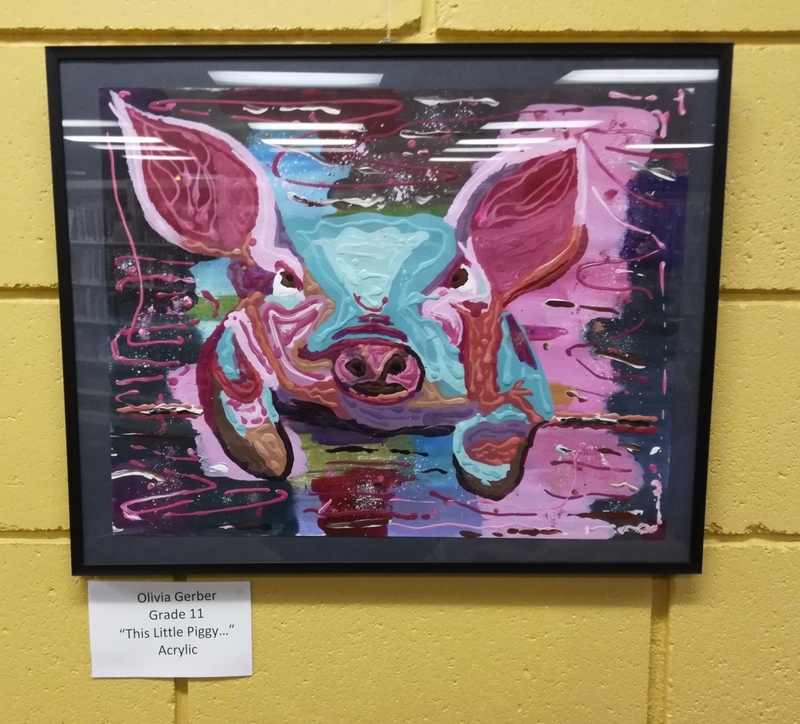 Browning, who has been teaching since 1989 and has been the full time RRS Art and Drama teacher since 2012, produced a variety of art prior to teaching. Bergeron is well known locally as the creator of the art alley (both the 2017 umbrellas and 2018 the soul of an octopus) at LUNA Festival. 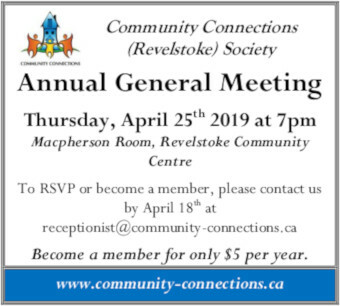 The Revelstoke Current had the chance to speak to a few of the artists. 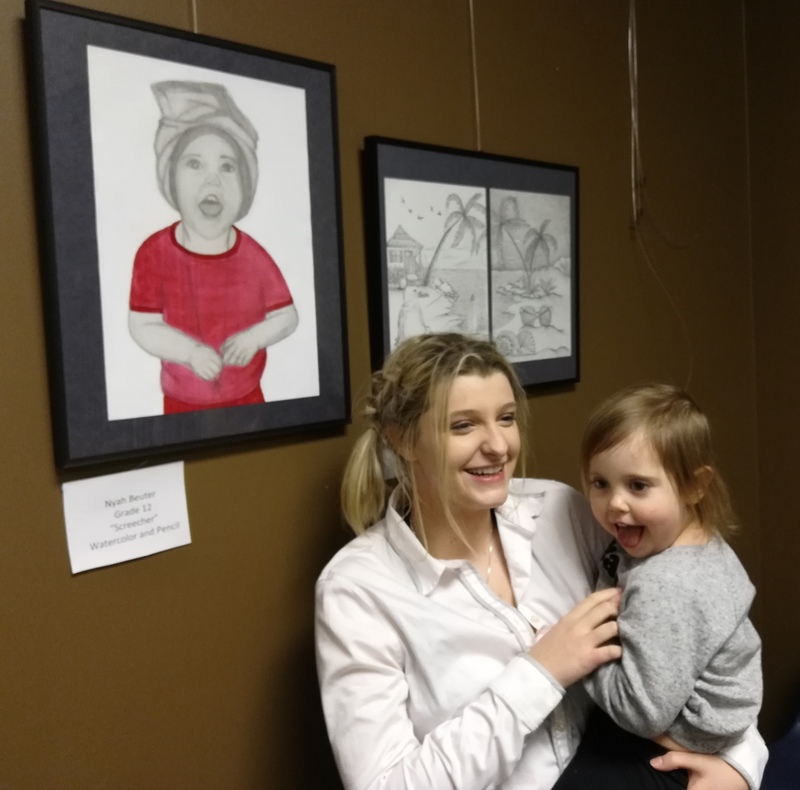 Nyah Beuter, a grade twelve student, had a drawing of her younger sister in the exhibit. The art piece was affectionately named Screecher. “She can really hit a high C naturally when she isn’t getting what she wants,” Beuter laughed. Prior to grade twelve, Beuter had never taken an art class. “My grandpa and my dad are artists and I guess I wanted to see what it was they liked and even the scales a bit.” Beuter’s work was very well done and her adorable subject was running around her feet, displaying the likeness Beuter had captured in her work. 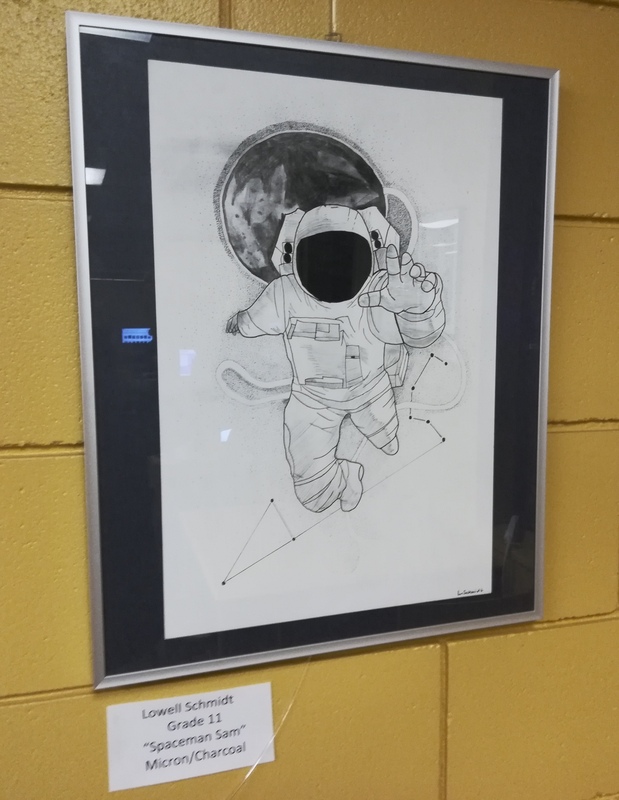 Eden Thomas, a grade eleven student, had two drawings on display. Her painting was inspired by Lauren Harris, a member of the famous Canadian landscape painters known as the Group of Seven. “They travelled throughout the Canadian wilderness and painted and drew what they saw in the landscape,” she says. “Each had their own style. This painting was from a school project where we used one of groups paintings as an inspiration for our own work.” Thomas has always enjoyed drawing, though the medium of painting is new to her. “I really enjoy the classes at the school, you get free rein so you can really explore what you like to create,” she says. 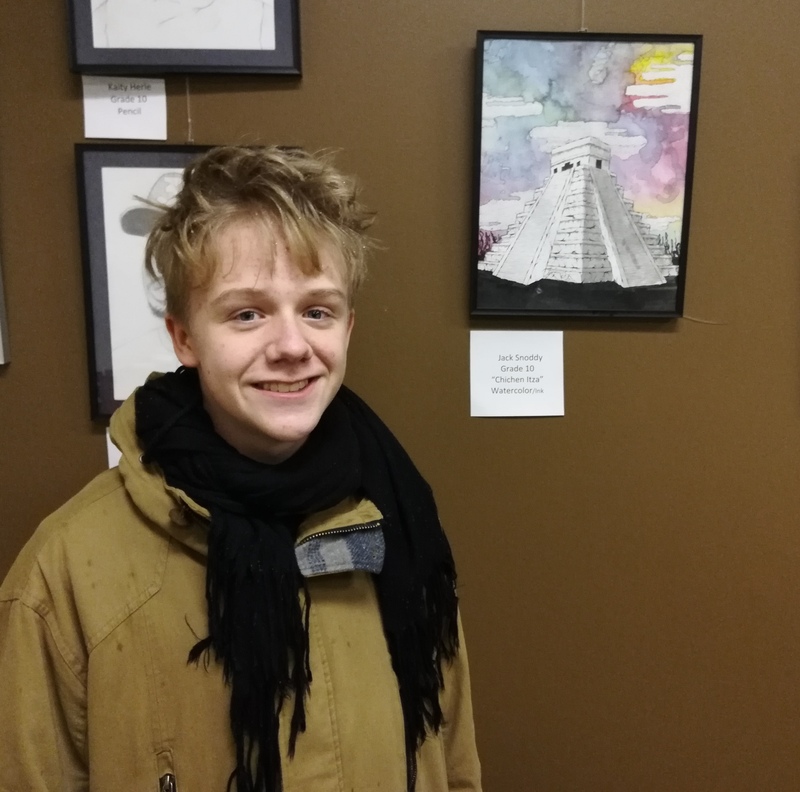 Grade ten student Jack Snoddy’s eye catching piece was a mix of watercolour and ink work. “It was inspired by a 1970’s comic that is was a kind of surrealist ink comic. It had this Chichen Itza architecture image I was inspired by, but I put my own watercolour style in the sky,” Snoddy explains. 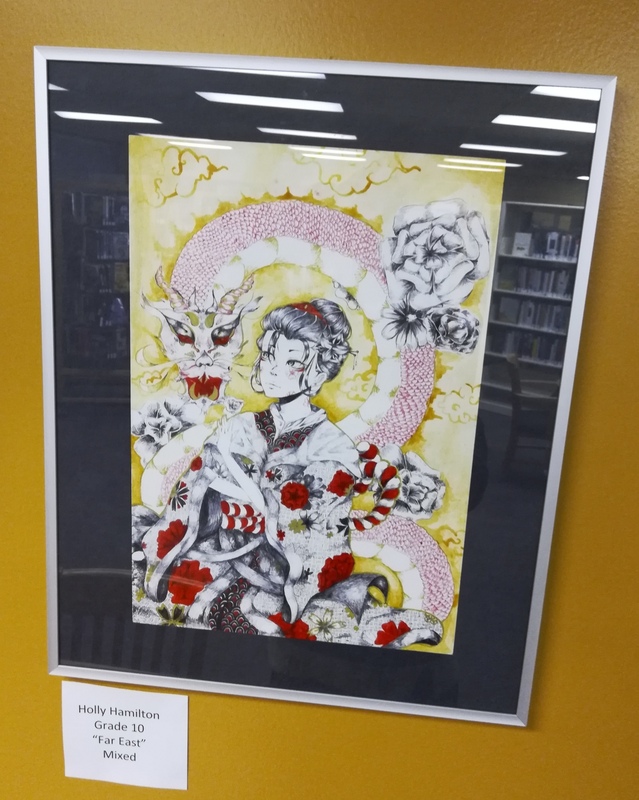 Many more pieces adorn the library walls. From ink to pointillism to oils to mixed media, from realism to the fantastical, there is something for everyone to enjoy. 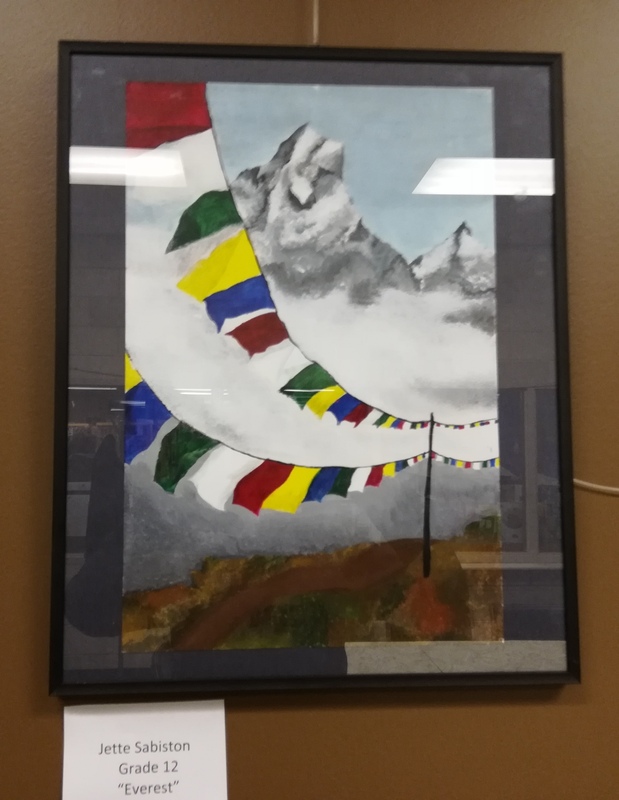 The pics below are just some of the art up for display. Snoddy with his ink and watercolour.